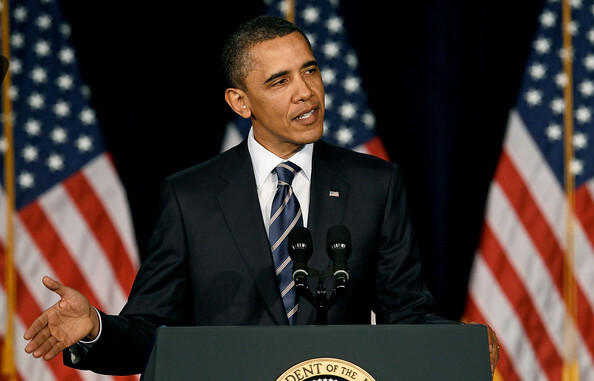 President Barack Obama speaks about fiscal policy at George Washington University on April 13, 2011 in Washington. *Fox News is at it again – this time catching heat for publishing an article appeared to suggest that President Obama’s speech Wednesday at George Washington University in Washington, D.C. was somehow tied to a student’s suicide at approximately the same time. Burgess Everett reports for Politico’s On Media that Fox has now removed the article, “GWU Suicide Tragically Coincides with Obama Speech,” after being contacted by GWU. “We were contacted by the university and decided it would be best to take down the story, although nothing was factually inaccurate,” a Fox spokesperson said in a statement to Politico. …GWU officials tell Fox that police were notified about the incident around 2 p.m., which happens to be at the same time that President Obama was speaking. A source tells Fox that the incident may have occurred earlier, noting that police went knocking on the student’s door at 1:30 p.m. As of this writing, Fox has not been able to obtain reaction from the White House. The article sparked outrage from the left and elsewhere Wednesday for appearing to make a connection between the tragic event and Obama’s fiscal speech on campus. The Atlantic Wire’s John Hudson notes that protests appeared on Reddit, Gawker, The Daily Kos and the Huffington Post. Mediaite also ran a critical breakdown of the story. A Facebook group called “HOLD CHERNENKOFF AND FOX NEWS ACCOUNTABLE” was also started by students to protest the article.